Do you have spaces in your mouth where teeth used to be? Missing teeth make your smile look incomplete and make it difficult to chew and speak properly. If you have missing teeth due to periodontal disease, injury, or any other reason, it’s important to fill in the empty hole. Dr. Burds can recommend which tooth replacement option – bridges, implants, or dentures – is best for you. After discussing all the possible tooth replacement treatments, how do you pick the best one? Consider answering these questions to determine your replacement and dental needs. How many teeth do you need to replace? Dental bridges and dentures can replace more than one missing adjacent teeth, while dental implants are designed to replace single missing teeth and roots. How strong is your gum tissue and bone structure? 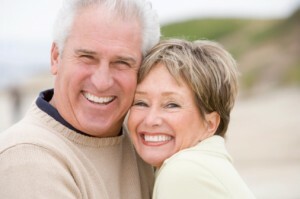 Since dental implants are planted into your jaw, they require enough supporting foundation. If you have a weak bone structure that won’t support implants, you should consider dentures instead. Do you want fixed or removable? Bridges and implants are fixed, which means they cannot be taken out of your mouth. Dentures, on the other hand, can be removable for sleeping and cleaning. Fixed appliances are generally stronger for more forceful chewing and biting. How are your adjacent teeth? Dental implants and dentures don’t affect surrounding teeth, but bridges require strong adjacent teeth to support a crown. Your tooth replacement method depends on several factors and conditions. Dr. Burds will evaluate the condition of your teeth surrounding the empty space, the shape and amount of space available, the thickness of your gum tissue, your overall oral health, the visual appearance of your smile, and budget concerns. All these factors will help you decide which treatment fits your needs and preferences. Contact Dr. Burds for your tooth replacement consultation. Call Gateway Dental Group in Des Moines, Iowa at (515) 244-9565 to restore your smile.